Last weekend, filmmaker Brandon Brown and I set out to find six celebrities buried in Arlington National Cemetery in Washington, DC. The venture took four hours and more than five miles of walking. To put that into perspective, we were hunting for six graves out of more than 400,000 people buried in the 26 square mile cemetery with roughly an 8 mile trail running through it. This week, I am highlighting these people who either served in the military or were married to military personnel. 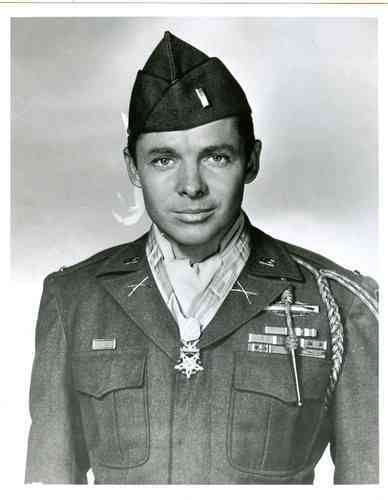 Audie Murphy with the Medal of Honor. After World War II, many men returned home from being a hero overseas to not having a difficult time finding work in the United States. Some, who didn’t know what else to do, turned to acting. Audie Murphy, the United States’s most-decorated soldier during World War II, was no exception. Unfortunately, his film career was not as stellar as Borgnine, Tony Curtis or James Arness who performed after fighting overseas. It was another Hollywood actor and a World War I veteran, James Cagney, who saw Murphy on the cover of the July 16, 1945, LIFE magazine. Cagney was impressed by Murphy’s good looks and invited him to Hollywood, according to the Arlington National Cemetery’s biography on Murphy. 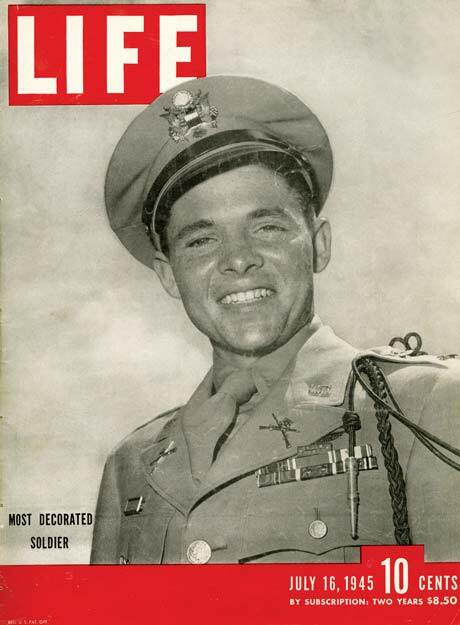 Audie Murphy on the cover of LIFE magazine. But the road to war hero and film stardom started when he sought to leave the life he had in Texas. Born to poor sharecroppers, his father left the family of 10, his mother died when Murphy was 16 and his brothers and sisters were being sent to orphanages or relatives. 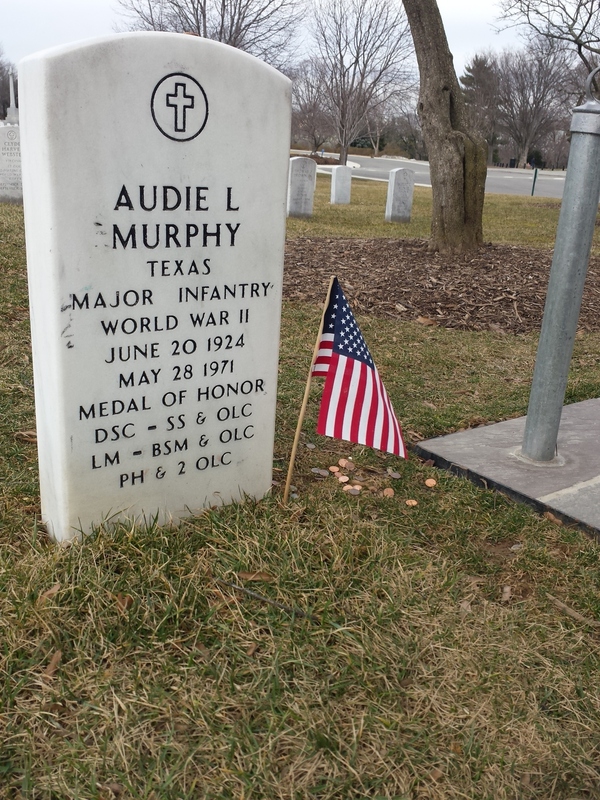 At age 17 in 1942, Murphy lied about his age to join the Marines, but they said he was too short and he was unable to join he paratroopers, according to Arlington National Cemetery. Murphy first saw combat in 1943 while he was with the 15th Regiment, 3rd Infantry Division in North Africa, preparing to invade Sicily. His unit then trained for the southern France invasion, Operation Anvil-Dragoon, where his division had 4,500 casualties, according to Arlington National Cemetery. The unit was in combat for a total of 543 days, about 150–Murphy served 390 of that– more than any other and Murphy was one of the few to survive. The unit had 1,100 officers and 21,000 enlisted men. Of that, 175 officers and 3,300 enlisted men were killed, said Hank Auld in an Oct.2, 1955, article, former commander of the 15th Regiment. The act of heroism Murphy, now a lieutenant, is most known for occurred on Jan 26, 1945, near Holtzwihr in France. The Allies were up against six German Panzer tanks and 250 soldiers. Murphy got on an abandoned tank and fired on the advancing Germans; firing for approximately an hour. He was injured in the leg but continued on and killed 50 soldiers. It is said Murphy killed more than 200 Nazis during World War II. This was one of three injuries Murphy sustained, he had two in his legs and one in his hip. 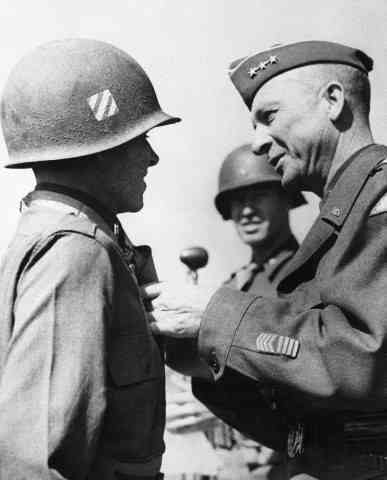 Murphy awarded for valor in 1945. Original caption: 1945-Europe: ANOTHER MEDAL FOR MOST DECORATED AMERICAN SOLDIER. General Alexander Patch of the U.S. 7th Army decorates Lt. Audie Murphy of Farmersville, Texas with the Medal of Honor.. Lt. Murphy is the most decorated American soldier, holder of every decoration for bravery save the legion of merit. He rose from the rank of private to become a company commander in 30 months of combat duty with the veteran third division. Murphy was recognized with the Medal of Honor, the United States’ highest military honor, for this act. Along with the Medal of Honor, he was the highest decorated soldier during World War II with 28 medals, including recognition from France and Belgium. Other honors include the Distinguished Service Cross, the Silver Star and several Purple Hearts. In 2013, Murphy posthumously received the Texas Legislative Medal of Honor, after his sister Nadine Murphy Lokey campaigned for him to be recognized. Despite his heroism, Murphy was very shy. He didn’t smoke and he didn’t drink, according to the June 2,1971, article “Reporter recalls conversation with Audie Murphy,” written by Associated Press reporter William Barnard, recalling when he met Murphy in 1945. When he returned home to Texas, officials chartered a plane to fly him to Dallas and a parade was held in his honor in Farmersville. However, Murphy changed all of the plans to ride with Barnard to see his family. Audie Murphy in “To Hell and Back” (1955), the dramatization of Murphy’s memoirs. In 1945, Murphy at 20 years old and went to Hollywood by Cagney’s suggestion. He also stayed in the military after the war by joining the Texas Army National Guard. “It beats picking cotton, but that’s about all,” Murphy said about acting in 1967. Cagney was organizing his own production company. Murphy was nervous and distraught when Cagney met him, and Cagney invited him to stay at his home and rest in Coldwater Canyon in Beverly Hills, according to “Embattled Dreams: California in War and Peace, 1940-1950” by Kevin Starr. His war experiences plagued Murphy with nightmares, an upset stomach, headaches and he could only sleep with a pistol under his pillow. He eventually turned to sleeping pills to avoid the nightmares, according to Starr’s book. Murphy later become one of the first veterans to discuss post-traumatic stress disorder (PTSD), according to a 2013 Los Angeles Times article. The PTSD was the cause of his divorce from actress Wanda Hendrix, who he was married to from 1949 to 1950. To help his acting, Murphy studied to lose his Texas accent, took dancing lessons and learned how to fence at the Actors Lab to prepare for acting. However, Cagney’s production company failed by 1947, and Murphy was staying at the health club on La Cienega Boulevard with other veterans, according to Starr’s book. Murphy’s first film was a small role in the western “Beyond Glory” (1948). Most of his film were westerns and many are sadly forgettable. His most famous film roles are “The Red Badge of Courage” (1951) and “To Hell and Back” (1955), where Murphy played himself in the film adapted from his 1949 memoirs. After making 40 films from 1948 to 1969, Murphy left Hollywood. Murphy never felt he was much of an actor. “I’ve made 40 pictures. I made the same western every time, but just with different horses,” Murphy is quoted in the Jan. 1, 1967, Los Angeles times article. Murphy was just 47 and a father of two sons when he died in 1971. His plane crashed while flying in Virginia. He was buried in Arlington National Cemetery with full military honors. His grave is one of the most visited, along with President John F. Kennedy’s, according to the Arlington National Cemetery. In 1967 Murphy was asked how people survive a war. “I don’t think they ever do,” he said. This entry was posted in Hollywood and the Military and tagged Audie Murphy, Audie Murphy Medal of Honor, Audie Murphy WW2 by Jnpickens. Bookmark the permalink. Excellent series of articles… all totally interesting and well writtten ! great stuff, Comet!